Wayne Roosa is chair and professor of art history at Bethel University in St. Paul, Minnesota. He is also a practicing artist. His essays on American painter Stuart Davis have been published internationally. He was an Andrew Mellon Research Fellow at the Metropolitan Museum of Art in New York, and a National Endowment for the Humanities grant recipient for work on Stuart Davis at Harvard University. He is the author of many catalogue essays and journal articles on theology and contemporary art. Isaiah’s love song concerning God’s people is one of loving aspiration for a good and thriving society symbolized as a beautiful vineyard, but also of anguished disappointment over that same society’s greed, violence, and bloodshed, symbolized by the vineyard’s tenants who turn to corruption. 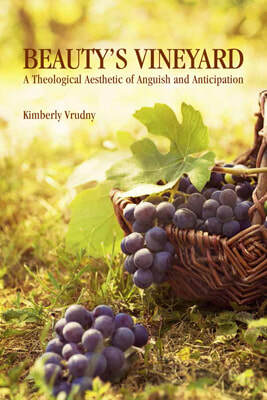 In many ways, Kim Vrudny’s Beauty’s Vineyard, A Theological Aesthetic of Anguish and Anticipation, is also such a love song; full of beauty, compassion, and hope grounded in her faith and deep love of people in our twenty-first century society, but also fraught with grief and prophetic confrontation for that same society’s systemic corruption, violence, and bloodshed. The central question running through her book is, “How do we understand a healthy society?” The compelling motor force animating that question is, “How—given the terrible paradox of God’s goodness in creation, humanity’s dignity as the imago Dei, and yet society’s continued history of unjust privilege, violence, and cruelty—do we dare still strive to form a healthy and just society?” And if we strive, by what understanding, what theological model, what language, and what social methods, might we have the courage to work for a just, peaceful, and nonviolent society? By what vision might we address today’s iteration of corruption and bring reconciliation to those who suffer from it? Vrudny’s model is revealed in the three aspects of her title: “Beauty’s Vineyard,” “a Theological Aesthetic,” and “Anguish and Anticipation.” In the syntax of this title, “Beauty’s Vineyard” stands at one end, suggesting a lush and wonderful place, a “vineyard owned by Beauty” (and its attendant transcendentals, the Good and the True); at the other end, contradicting that lush place, stands “Anguish and Anticipation.” Between these is the brutal violence of the world as we know it, in want of resolution and reconciliation. And to that terrible “between” Vrudny brings the middle phrase, “a theological aesthetic,” for mediation. Will this concept/term—and, the reader assumes, its corresponding method--reconcile the conflicted images conjured by a beautiful vineyard set against anguish, anxious in anticipation? How does a “theological aesthetic” help us realize goodness, challenge corruption, and bring healing within our actual society? What is a “theological aesthetic”? There is a long history of theology used to address the terrible gap between beauty and anguish; there is also a long-standing use of art to soothe anguish over with beauty. But is there a “theological aesthetic” that actually reconciles the beloved’s vineyard with the tenant’s corruption and violence? To some ears, “aesthetics” sounds too soft. But Vrudny’s is hardly a romantic approach. She grounds her arguments firmly in the hardness of real time, real politics, real suffering, and concrete contexts: apartheid, Argentina’s “dirty war,” torture, holocaust, a mother’s loss of her child, systemic racism. She also explains how social systems make people safe or endangered. These “structural sins,” these “systems of jeopardy,” thrive on privilege for the insider while doing great harm to the outsider. Against these wrongs, Vrudny brings a “theological aesthetic.” Why an “aesthetic”? Why not something “strong,” “hard,” clearly analytical, a theological critique, a theological hermeneutic, a theological exegesis, a theological sociology? Indeed, these are all folded into her thought, but her foundational approach rests upon an “aesthetic.” Her reason is that an aesthetic is first and foremost relational and empathetic. An aesthetic description brings truth but, by its nature, more easily allows for paradox, complexity, and mystery. Further, as she makes clear in chapter five, parables, stories, aesthetics, and empathy better enable us to open ourselves to others than do didactic moralizing or ideological confrontations. In the end, any theological model hoping to challenge corruption and privilege, while reconciling suffering, let alone rebuilding a just society, will need empathy, relationship, paradox, complexity, and mystery. This is borne out in Vrudny’s method and logic as her chapters build. Each chapter opens with a work of art or story of an actual person’s suffering, thus foregrounding abstract questions with specific people or empathic artworks. This is followed by more abstract theological discussion and analysis, often deeply technical and historical as background. And that, in turn, is then met with revisions of such theology as we face the realities of contemporary events. This order of address is crucial to her theological aesthetic: persons, suffering, and dignity first; abstract theology second; mediation third. Thus, in “Beauty’s Allure” (chapter one), we are met with a series of paintings by Jerome Witkin, A Jesus for Our Time, in which a young fundamentalist preacher goes to Beirut to preach the gospel out of his absolute confidence in a clear theology. But when he encounters the killing of civilians and the impossible contrast of political points of view clashing in the Middle East, his simplistic, propositional theology will not hold. Next to these paintings, Vrudny relates her own spiritual and theological journey as the didactic fundamentalism of her youth failed her in the grief of losing a child and in traveling the world where suffering, poverty, and other world views undid fundamentalism. Out of these traumas, she too had to forge a faith capable of coping with the inconsistencies and paradoxes of experience. This challenge to the adequacy of one’s theology against real suffering leads to chapter two, “Beauty’s Companions: On the Good and the True,” where she burrows deep into a technical engagement with theology, language, sacrament, analogy, the Trinity, and Mystery. This is prefaced by a Mark Rothko painting, his pure and brooding abstraction suggesting that ineffable Mystery must be acknowledged and integrated into any understanding we embrace or system we employ. The profoundness of her aesthetic approach here allows the relational and empathetic nature of the Trinity to become generative precisely because it is relational. This is Vrudny’s model. She celebrates the Trinitarian Being of God via a “trinity” of divine actions: creation of humans as imago Dei, incarnation as salvific, establishing the Christian community as a vineyard living by justice, mercy, love, and nonviolence (if, indeed, it does). Here Aquinas’s transcendentals—Beauty, Goodness and Truth—become names for God and we are related to them, not merely by metaphor, but deeply and structurally by analog. In chapter three, “Beauty’s Trace: On imago Dei,” she examines what the imago Dei means, and asks what happened to us through sin. Samuel Bak’s painting, Sanctuary, and the holocaust it speaks of, are the inciting image and empathetic experience. Again, she examines the adequacy of theological models, contrasting the sacramental Catholic versus the metaphorical Protestant paradigms. In the first, sin “damaged” the imago Dei on every level, yet left its essential reality in place; for the second, sin “utterly destroyed” the essential image, leaving us each “totally depraved.” “This,” Vrudny argues, “is not merely a semantic difference.” How we understand and linguistically frame the imago Dei, sin, forgiveness, and atonement will affect how we explain suffering and, therefore, how we structure social relationships, value, and dignity, especially when it comes to those who are not like us. The implications of this are laid out in “Beauty’s Veiling: On Sin” (chapter four), “Beauty’s Incarnation: On Forgiveness” (chapter six), “Beauty’s Lament: On Suffering” (chapter seven), and “Beauty’s Imagination: On Hope” (chapter eight). The limits of space allow for comment on only two aspects here, which are, perhaps, Vrudny’s most radical, challenging, and hopeful offerings. The first is her discussion of sin. Dividing sin into three realms—personal, relational, and structural—she acknowledges that we all are most aware of the personal and relational dimensions, but are typically blind to structural sin because it is such a part of the cultural fabric that it may be assumed or even thought of as “natural.” To shatter this, Vrudny creates a flow chart of social systems which she calls “systems of jeopardy.” Under this rubric, she identifies “cultures and structures” that promote either “violence or privilege,” depending on whether one is a favored insider or a disdained outsider. She notes multiple discriminations (gender, skin color, orientation, age, and religion) and social systems (education, health care, economic opportunity and citizenship) within which persons must live. For those favored in an American context—say a young white Christian heterosexual male in good health who is educated—these systems offer him privilege, allowing him to thrive. For others—say an aging black Muslim lesbian woman with health problems and little education—they harm. This is an indictment of Western and American patriarchy. Many readers may complain that she overlooks the many exceptions, and unfairly caricature persons today who, even if a white male, have made genuine efforts to live differently. Nonetheless, the overall sweep of this is all too true, historically and still today. And it is inadequate to explain such privilege or harm as caused by personal choice and relational sin alone. These are equally structural matters in which we are complicit and for which we are responsible. Of essential importance to Vrudny is that these conditions are concrete, political, here and now; and that the requirement for Beauty’s Vineyard—for a loving community hoping to make a difference—is that they act for justice here and now, as well as for eternity. The second radical element is Vrudny’s treatment of atonement and forgiveness. She rejects Calvin’s theology of total depravity and its implication that we are worthy only of complete retribution, that is, killing and eternal punishment, just as she reject’s Anselm’s theology that humans owe a debt to God which only a divine being can repay. Instead, she favors again an aesthetic approach, where she sees that the imago Dei is still fundamentally present in us despite sin, veiled by one’s personal, relational, and structural participation in sin. As a result, our fallen person is in need of compassion and healing, and in radical terms. So, in Vrudny’s restorative model of atonement to which readers are introduced in this volume, God extends forgiveness to humankind through the covenant to the Jews and through incarnation for the Gentiles. And in both restorative movements, God invites humankind to reconcilation with God through the healing of the world. Thus, God does not inflict murderous torture onto Jesus or allow Jesus to be slain—as if violence can purge corruption and instill goodness. Rather, in Christ, the divine Logos, the Beauty of God, enters into human form and stands in perfect opposition to sin in all its forms: personal, relational, and structural, and meets death on account of his posture. But in so doing, Christ demonstrates the behavior which the Holy Spirit empowers within those who become his disciples—the courage to resist sin not only personally and interrelationally, but also structurally. As he confronts evil nonviolently, he calls us to do the same, respecting the essential humanity--imago Dei—of both perpetrator and victim. Vrudny grounds all of this in ubuntu, the South African perspective that we are human through each other. Though Christian attempts to live likewise will be inevitably flawed in practice, this nonetheless substantiates what Beauty’s Vineyard should be. Her book will challenge, disturb, change and inspire, whether the reader fully agrees or not. It is a profound and enriching read that makes God’s love and justice concrete, while asking something profound of us. After reading it, it struck me that, although she is not claiming this, Vrudny’s book relates to the genre of utopian literature. One thinks of Plato’s Republic, Augustine’s City of God, Thomas More’s Utopia, or John Winthrop’s City on a Hill. Each of these operates through an aesthetic imagination, creating a community as a parable. Each develops a theory of the just society against the backdrop of corruption and violence. And each offers an ideal society by setting their imagination apart from the rest of the world. Plato seeks the just city-state and the philosopher king against the backdrop of Athenian ambition and the Peloponnesian Wars; Augustine defines the vison of a newly minted Christianity as God’s City set against pagan Rome in decline; Thomas More imagines an island utopia in light of new humanist social theories and the imminent rise of the Protestant Reformation against the Catholic Church and Monarchy; and Winthrop imagines the Christian community as a moral beacon, a Christian exemplar against European corruption and the Eden of a new world. It is interesting that the Christian writers here each proposed an ideal society exactly at a time in history when their world was on the cusp of radical change. This raises two questions. First, is Vrudny writing on the cusp of some historical change? The racial violence that has erupted in our country is proof of how deeply present and metastasized is structural racism, white male privilege, and hatred of others. Second, is Vrudny’s book in any way different than these other utopian efforts? If so, it seems to me her difference lies in a belief that a good society is only beautiful and true when all are valued, when deep reconciliation--ubuntu, not bloody purges—can occur, and when empathetic healing, not retributive torture, are possible. Is this too utopian? Yes. But do we want to believe in anything less?